Our developer preview of MongoDB Enterprise Server running on OpenShift now includes a simple OpenShift Template. The mongodb-openshift-dev-preview.template.yaml template file reduces the complexity and additional requirements of running OpenShift with the --service-catalog enabled and deploying the Ansible Service Broker (not to mention needing to install the apb tool on your development system in order to build and deploy the Ansible Playbook Bundle). Currently the template can provision multiple pods each running an automation agent configured to the same MongoDB Ops Manager Project. You can complete the deployment of a MongoDB replica set with a few quick clicks in the Ops Manager user interface. We hope the removal of these additional dependencies helps you and your organization quickly adopt this modern, flexible, and full featured way to deploy and run MongoDB Enterprise on your OpenShift clusters. And, stay tuned! This is the tip of the iceberg for support of your cloud native workloads from MongoDB. In order to compete and get products to market rapidly enterprises today leverage cloud-ready and cloud-enabled technologies. Platforms as a Service (or PaaS) provide out-of-the-box capabilities which enable application developers to focus on their business logic and users instead of infrastructure and interoperability. This key ability separates successful projects from those which drown themselves in tangential work which never stops. In this blog post, we'll cover MongoDB's general PaaS and cloud enablement strategy as well as touch upon some new features of Red Hat’s OpenShift which enable you to run production-ready MongoDB clusters. We're also excited to announce the developer preview of MongoDB Enterprise Server running on OpenShift. This preview allows you to test out how your applications will interact with MongoDB running on OpenShift. Platforms as a Service are increasingly popular, especially for those of you charged with building "cloud-enabled" or "cloud-ready" applications but required to use private data center deployments today. Integrating a database with a PaaS needs to be done appropriately to ensure that database instances can be deployed, configured, and administered properly. A modern, rock-solid database (like MongoDB). Tooling to enable telemetry, access and authorization, and backups (not to mention things like proactive alerting that integrates with your chosen issue tracking system, complete REST-based APIs for automation, and a seamless transition to hosted services.) For MongoDB, this is MongoDB Ops Manager. This strategy enables system administrators to quickly deploy "MongoDB as a Solution" offerings within their own data centers. In turn, enterprise developers can easily self-service their own database needs. If you haven't already, download MongoDB Ops Manager for the best way to run MongoDB. Our "developer preview" for MongoDB on OpenShift can be found here: https://github.com/jasonmimick/mongodb-openshift-dev-preview. The preview allows provisioning of both MongoDB replica sets and "agent-only" nodes (for easy later use as MongoDB instances) directly through OpenShift. The deployments automatically register themselves with an instance of MongoDB Ops Manager. All the technical details and notes of getting started can be found right in the repo. Here we'll just describe some of functionality and technology used. The preview requires access to an OpenShift cluster running version 3.9 or later and takes advantage of the new Kubernetes Service Catalog features. Specifically, we're using the Ansible Service Broker and have build an Ansible Playbook Bundle which installs an icon into your OpenShift console. The preview also contains an example of an OpenShift template which supports replica sets and similar functionality. 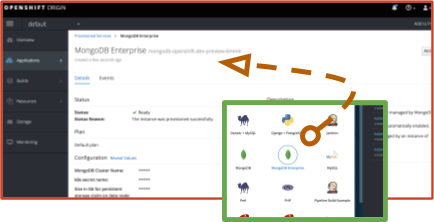 Once you have your development environment ready (see notes in the developer preview Github repository) and have configured an instance of MongoDB Ops Manager you're ready to starting deploying MongoDB Enterprise Server. Clusters can be provisioned through the OpenShift web console or via command line. The web console provides an intuitive "wizard-like" interface in which users specify values for various parameters, such as MongoDB version, storage size allocation, and MongoDB Ops Manager Organization/Project to name a few. Command line installs are also available in which parameter values can be scripted or predefined. This extensibility allows for automation and integration with various Continuous Integration and Continuous Delivery technologies. A future post will detail cluster configuration and various management scenarios, such as upgrades, performance tuning, and troubleshooting connectivity, so stay tuned. We're excited to introduce simple and efficient ways to manage your MongoDB deployments with tools such as OpenShift and Kubernetes. Please try out the developer preview and drop us a line on Twitter #mongodb-openshift or email bd@mongodb.com for more information. Be a part of the largest gathering of the MongoDB community. Join us at MongoDB World. MongoDB World: Just another conference or something different?